LOCATION: On county road off FM 243, 7 miles NE of Bertram. 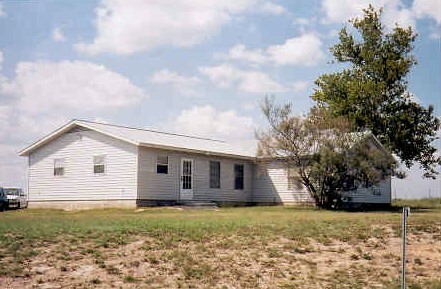 Some of the first settlers in this farming and ranching community were the William Alexander Faires Family in 1874 and the Martin Luther Ater Family the next year. The settlement was called "Pool Branch" for a nearby pool formed by a waterfall. In the 1880s a cotton gin and mill were located on the pool which was known as "Mill Pond". there was a store, a blacksmith shop, and one mile from the gin, Mrs. Hattie Snow Smith ran a hat shop in her home. J.S. 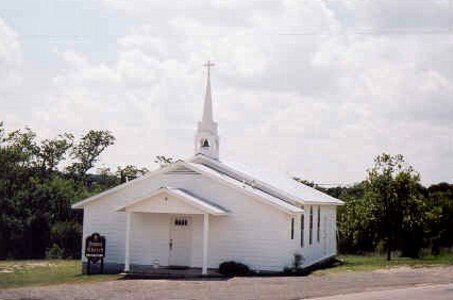 and Jane Danford of Delaware County, Iowa, gave two acres in 1881 for a school and church, provided the schoolhouse was completed by March 1, 1882. Area residents met the deadline. 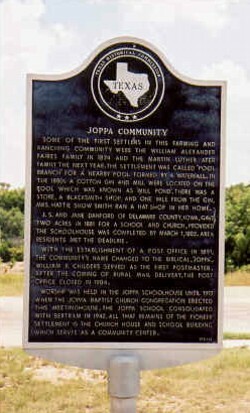 With the establishment of a post office in 1891, the community's name changed to the biblical "Joppa". William F. Childers served as the first postmaster. After the coming of rural mail delivery, the post office closed in 1904. You are our [an error occurred while processing this directive] visitor to this page.